Today I thought I would share with you some of my revision tips that I have picked up along the way. I am currently in my first year of university and in the middle of revising for my summer exams. 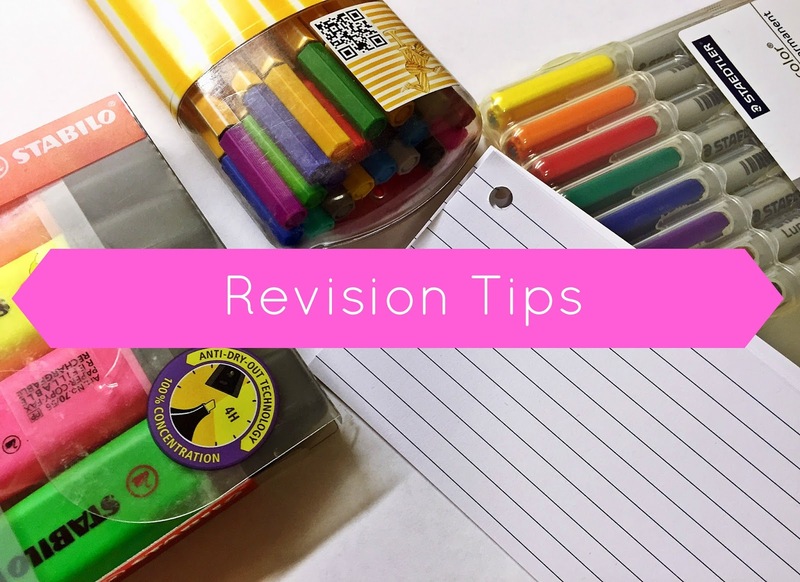 I have already gone through both my GCSE's and A-Levels, so I think I'm (unfortunately) becoming a bit of an expert when it comes to revision! 1. Start early- Even if you start off with a couple of hours a day, you'll definitely be less stressed than if you try to cram all of your revision in the last week. 2. Re-write your class notes onto index cards- This is a great method of revision as you're condensing your notes into smaller, more manageable chunks, whilst also refreshing your memory on what you have previously learnt. Try to abbreviate your class notes and summarise the most important stuff. I like to start with this method when I begin to start revising. This also means your notes are more travel-friendly as you're not lugging around your workbooks, or masses of A4 paper around with you. 3. 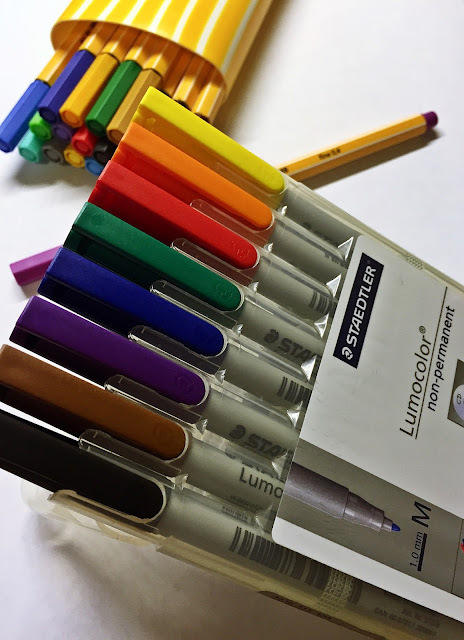 Use colour- This makes your notes more appealing and stand out more. It also makes revision that bit more bearable. Have fun with it, be creative! 4. Take regular breaks- I'm sure everyone will have already told you this but it's important to take breaks during your revision as 9/10 times if you've been revising for hours on end, the information isn't going to go in. Watch an episode of your favourite programme, go for a walk, or even just call up your friend and have a natter. Just take your mind off of your revision for a short while, then come back to it with a fresh mind. 5. Stay hydrated- Make sure you're staying hydrated and drinking a lot of water. This will help to keep you awake and refresh your brain. Perfect tip for during the exams too- keep drinking water!!! 7. Stick-up revision notes- This used to annoy the hell out of my mum during my GCSE's especially. I had a maths equation formula stuck up on the fridge at one point! Write up important facts or figures on post-it notes and stick them up around your house (ask for permission first, of course!) Subconsciously, you'll be learning the information as you walk past it and read it a few times throughout the day. This can really come in handy whilst you're sitting your exams too, thinking "I know this! It's on the bathroom door!" 8. Make a revision timetable- This might work for some people, and not for others. But I would say it is an essential if you're doing your GCSE's as you obviously can't study 10 subjects in one day. It's a good idea to plan out what days are for what subjects, so that you're making sure you are covering all your subjects. 9. Find a quiet place to study- You want to be revising in a distraction and clutter-free space. 10. Make a playlist- Depending on if you like to revise with music or not, you shouldn't be revising to Panic at the Disco! or something loud and heavy. Try to find some slow, calming songs and make a playlist so that you can listen to that whilst you're revising instead. This also limits the risk of you blurting out into song and turning into Beyoncé. 10. Test yourself- Use index cards to learn key terms or facts and test yourself. For example, on one side of the card you could ask a question and have the answer on the other side of the card. You could always ask your family or friends if they will test you as well! I hope you found these tips helpful and good luck with your exams!